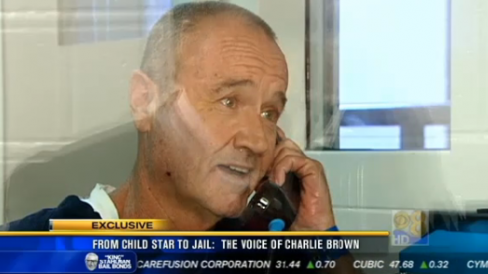 A man who was the voice of Charlie Brown in several “Peanuts” specials was sentenced Monday to four years and eight months in prison for threatening his former mobile home park manager and trying to threaten Sheriff Bill Gore from jail. Peter Robbins, 59, pleaded guilty last month to making a criminal threat and attempting to make a threat. He unsuccessfully tried to withdraw his guilty plea Monday in a hearing before Retired Los Angeles County Judge William Chidsey Jr.
“We’re satisfied that it’s all over,” said Patrick Brophy, the property manager of the Oceanside mobile home park where Robbins once lived. Brophy’s wife, Renee, told the judge that Robbins threatened her husband’s life — sending him graphic drawings and letters detailing what he might do to the couple — and also harassed other residents in the mobile home park. Renee Brophy said Robbins’ actions caused a “horrible nightmare” in their lives. “Peter Robbins created more than just a little chaos,” she said. Last month, Robbins told a judge that he has been diagnosed with paranoid schizophrenia and bipolar disorder. The defendant pleaded guilty in 2013 to threatening his girlfriend and stalking a doctor who performed breast-enhancement surgery on her. He was sentenced to five years probation and ordered to enter a live-in drug treatment program and meet other conditions. Robbins was re-arrested this year for probation violations, including cutting off his GPS bracelet, drinking alcohol and failing to complete domestic violence classes. In September, Robbins was charged with making criminal threats against Judge Robert F. O’Neill, writing letters from jail in which he offered to pay $50,000 to have Gore killed, and threatening Brophy.